Walking away and Letting go. It's OK to value YOU! 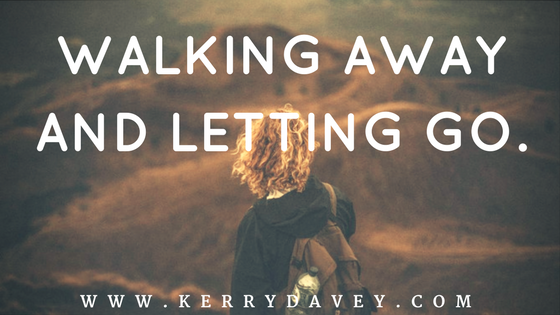 This is a theme that runs through all our lives, whether it’s a relationship, friendship, job, situation or lifestyle choice there comes a point in your life when you are faced with a decision of whether to walk away or stay in the same unhealthy cycle. That mental tug of discomfort, called cognitive dissonance, is when you hold two conflicting beliefs, values or opinions that conflict with each other. A perfect example of this is when my daughter was younger I had an important work meeting on the same day as her school assembly. I value my work ethic, doing the right thing, not letting people down and working hard. I also value being a mum and always being there for my children. On this day I had two values that completely conflicted each other. I listed them in hierarchy of importance and without doubt being a mum ranked higher than career. This made my decision easy, I followed my truth and chose to go to my daughters assembly. Did I feel totally uncomfortable phoning my boss and telling her? Absolutely, but although I struggled with the difficulty of letting someone down I didn’t have to wrestle with my conscience on whether I was making the right decision for me. When you are faced with a decision that is causing you conflict think about what is holding you there. What is causing you conflict? Family often have huge power to mess with our mojo, we’re bought up to respect family, respect your elders and fit into the role assigned to you. But what happens when you grow? What happens when it’s no longer comfortable? What happens when your family values conflict with your own values of growth, development and independence and they are holding you back? You have a choice. Are the relationships capable of changing and growing with you? Do you share common morals, ideas, behaviour patterns and values? If you find there is something there to work with then you can work on altering or changing the relationships that are causing your dissonance so the discomfort disappeared and harmony can reign. Sometimes though, you may find there is nothing there and you choose to walk away. While this is a difficult decision to make as it conflicts with a value of family, if the value of self-esteem and growth ranks higher then you know it’s the right thing to do. So whether your dissonance relates to a relationship, a family member, a friendship or your career when you sit and organise the priority of your values the answer is always clear. You’ve just got to take action. And it’s ok to change, it’s ok to make decisions that suit you, it’s ok to love and respect yourself enough not to dwell in the negative. In life, we evolve and we outgrow stuff. Friends, jobs, lifestyle choices, our own thinking changes and grows and we outgrow our old habits. Once it’s done, you’re free. Once you’ve walked away you’re free to then work on the emotional side of letting go. You’re free to find your own truth and balance yourself, you’re free to enter your future with a magical curiosity of ‘what’s next’? You’re free to be yourself and create your own adventures with a lighter soul. Following the path of least resistance is not always the best option. Sometimes following your heart and your truth takes courage and guts and a whole heap of balls. But the decision is always yours. Or stay in a situation or relationship that suffocates and squashes who you are. Hi I'm a Personal Development Coach who supports overwhelmed entrepreneurs to build rewarding and sustainable businesses by reconnecting to their inner truth, setting smart strategies and taking consistent action. I believe this combination of simplicity + strategy + soul is the key to being a vibrant and magnetic entrepreneur who attracts ideal clients with ease. I love working with entrepreneurs and small business owners who are positive, driven action-takers with a desire to share their inner beauty and radiance with the world. A near-death experience led me to follow my passion for supporting and guiding others through periods of transformational growth. I believe that we shouldn’t take life too seriously and that running a business should be fun and rewarding. What I learned along the way is that it’s so important to balance the feminine and masculine energies in our work. You can’t have 100% soul-led, feminine energy and no strategy, nor can you succeed with a business plan and no connection to your inner self. There has to be a balance and creating that can be both enlightening and fun.